Traditionally Southern Caifornia Transit Advocates does a day-after-thanksgiving study tour , usually to explore service in far-flung areas outside urban Los Angeles (Santa Barbara, San Diego, Victorville, Bakersfield). Schedules are posted on the websites of Metro andFoothill. The reason we are interested in owl service is at a meeting of the Metro Citizens’ Advisory Council earlier this year I learned Metro next year will be considering whether to change how it operates service overnight. 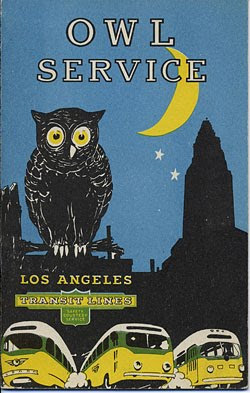 Instead of having most bus lines run into downtown L.A. for the hourly “line’-up” timed connections, the agency might operate the Red Line 24 hours and have owl bus service feed into that. This would open up possibilities versus the time constraints that currently shape how owl service is operated. It seems like a good time to start contemplating what we think the changes should be and go out to investigate the service operated now — are there gaps in service, or lines with low ridership that may not merit continuation? Please post comments with any thoughts you have about owl service. And please note at this point running the subway overnight is just an idea Metro staff is starting to think about. Nothing at this point is set in stone. As always anyone who wishes is welcome to ride along with us. The itinerary was prepared by member Charles Powell. That’s an interesting plan. I just wonder how frequent the Red Line would run at night. From what I can recall, even the 24hr NYC lines run at 20 minute intervals late at night. Metro’s standard for rail is at least 20 minute headways. I wonder if they would go to 30 minutes in owls for the Red Line. We’ll see what is proposed. Philadelphia runs its subways every 20 minutes after midnight (weekends only), Chicago run its Red Line (the only 24 hour line there) every 15 minutes. I belatedly realized that there is a mistake in my post. Metro operates the Silverline which I confused with Foothill’s Silver Streak.Mark Strickert and Charles Powell participated for the entire tour (which had some mid-trip tweaks due to a late Silverliner) with Perias Pillay joining us for the second half. Is Philly’s 24-Hour Subway Service the Wave of the Future?